It started in 2011 when John Kimmel and I were discussing putting together a video game company. We were testing a tactical arena miniatures game, but that was to be the basis for a new First Person Shooter game. Something magical happened that day when John and I realized it was much more fun to play board games than any of our most recent video game experiences. 2011, was before Kickstarter had exploded with the largest funded Kickstarter game Zombiecide from Cool Mini or Not. Later in May of 2012 Zombiecide would go on to raise over $700K and be the largest board game funded project on the platform at the time. This project re-affirmed to John and I that we were on the right path for making games. Sularia at this point had been in development wiith a few select locals for almost six months. It was nowhere near ready for the public eye. At this time the Jotune, Synthien, Exsularian, and Protoan while designed were called the Shien-Too, Sentients, Waste Walkers, and Beasts. Two years after Zombiecide’s success, Punch-It Entertainment was officially formed by John Kimmel and I as we prepared to bring a world to the world. We only had a concept a mechanical prototype, and a dream. The world of Kickstarter had exploded, and 2014 started to see a shift from conceptual products to a need for an even more advanced and well-presented product, what many were calling a Minimally Viable Product. John and I were working hard to make the best card game experience we could, one that was based around our favorite card games such as VS. System and Magic The Gathering, as well as bringing a unique twist by incorporating strategy and experiences players found in Real Time Strategy Video games. Finally, in June of 2015, we were ready to pull the trigger. We invested all the money, time, and energy we could to prepare for a Kickstarter, only to see White Wizard fresh off of the success of Star Realms launch Epic:The Card Game one week before our Kickstarter launch. In conjunction, we made a bold marketing move and invested thousands of dollars to attend Origins Game Fair to capture attention and excitement for the game. The purpose was to hit the 2015 Christmas release schedule and make our mark on Kickstarter with our new release. Going up against, Juggernauts proved to be challenging and through efforts our campaign funded. John and I worked day and night, earning almost every single pledge on that campaign. We not only had to sell the game, but we knew we had to earn the backers’ trust and investment. It was a very long month for us, and we extended the Kickstarter by one extra week to have the opportunity to earn more backers while showing the game at KantKon 2015, in Kansas City, MO. We missed Christmas delivery on the product due to a manufacturing delay, but we launched Sularia officially 30 days later, two weeks after our backers had started receiving their copies. We are always eternally grateful for all of the original backers and those of you that have stayed with us through the adventure. John and I had been told by many that doing a expanding card game is not for the faint of heart. Boy! Those advisors right; we did not understand the scope of work necessary to release these kinds of games consistently. At the same time, we knew we needed an expansion within 90 days, as that was the strategy almost all "industry experts" had advised. In March 2016, Punch It Entertainment launched Blood, Profit, and Glory, and once again we were successful...just barely. More experts came in and told us that we couldn't release expansion content only on Kickstarter, as the platform doesn't support it well. For the most part, they are correct. BPG, only funded slightly above the funding line, and we are of course are so appreciative of our fans support. Many experts agree that conventions are the direct path to raising awareness of your game and growing sales. Punch-It Entertainment bought into this idea, and we spent significant money purchasing booth equipment and paying for travel. In 2016, Punch-It Entertainment did 12 different conventions around the area, as well as a few further away. The costs associated with those endeavors were staggering, and we faced our first year of income losses and which left us in a challenging position and left a lingering question: How in the world are we going to make the Protoan and Exsularian? We discussed and brainstormed this over countless meetings and coffee breaks. Behind the scenes, our development team worked to make those factions play, be balanced, yet fun with the existing product. We still didn't know how we're going to fund the five figure costs of putting illustrations to the product and releasing it as a stand-alone expansion. We decided that Kickstarter would be the best venue. With excitement and anticipation looming, we hit a development snag. The bookend mechanics for the Protoan and Exsularian, Anarchy and Virus were simply not fun. They ended up staying in deck boxes on bookshelves and players played strategies that felt very Jotune or Synthien. With our two newest factions lacking a clear identity, we adapted as a company and had to issue the dreaded word of "re-design" in our meetings. We are fully committed to releasing only the best and highest quality products in both production value and gameplay. The decision was a no-brainer, but it left us without a single new product for the 2017 year. With minimal sales in 2017, we were very concerned on how to even keep Punch-It's doors open. We struggled, made personal financial donations to the business, and continued to push the development needle on the Protoan and Exsularian. During that time, with your feedback, we determined that the re-design was successful and that the new factions were fun to play. We had received so much feedback that a book of our fiction and lore was highly desirable, so we thought. John and I shifted our attention on how to release Chronicles of Sularia. Unfortunately, the vocal minority had overcome the core audience and Chronicles was a dud on Kickstarter. In the future, we still hope to offer a coffee table book on the world of Sularia that incorporates Matt Och's fantastic fiction in the world, alongside the art and development of the game. In 2018, we decided to launch Reign of Terror - The Protoan as a stand-alone faction pack. The goal was to re-energize our existing fan base and bring back as many original backers as possible. Unfortunately, we were not able to fund the Protoan through Kickstarter and we were left looking at what to do with the game. The Protoan were complete and financially we were in a place where we could complete the remaining illustrations for The Good, The Bad, and The Savage - The Exsularian. We had found a short run print supplier that could help us make 50-100 games which made sense economically. Our Pre-orders were high, and our community rallied around Sularia leaving Kickstarter. Unfortunately, none of the three products launched this year have provided us with a significant enough uptick of income to proceed. We are back to exactly where we were right after Blood, Profit, and Glory. So, what does this mean for Sularia in 2019? In September of this year, we stopped working on future content for Battle for Sularia: The Card Game. Without a clear funding path, we cannot keep making financial decisions that do not allow the game to grow. Not all is sour, we believe 2019 can be the first light in developing and sharing Sularia with the world. That's where you, our most passionate fans of the game come in. 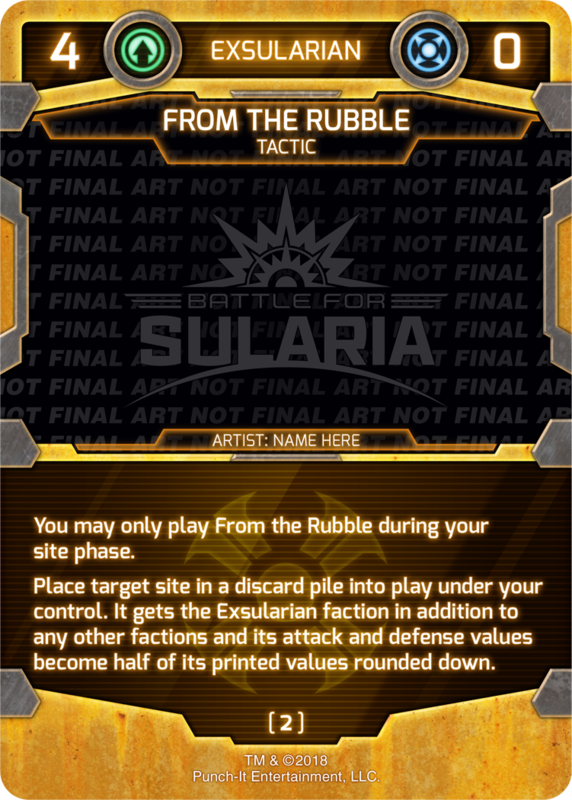 Battle for Sularia: The Card Game is complete now that all four factions available for purchase. We are working hard to create an affordable core experience, and we will continue to do so, to make the barrier of entry into the game friendly for all card game players. Creating alternate art promo cards for players to earn by attending events. Creating an ambassador program that builds incentives for you to share the game and grow the game. We are ready with open arms to support your local game store directly and eliminate the distributor who pushes our games to discount online retail stores. By controlling whom we do business with, we can make sure that retailers can be profitable with our products and support small businesses in your community. We have some additional news, I do regret that John Kimmel has decided to leave Punch-It Entertainment. John has made the decision to pursue some other opportunities with his freelance graphic design business, John Kimmel Creative. We are sure you will find more of John's excellent work in an upcoming card game called Argent Saga. John leaving the project is particularly tough on us here at Punch-It as we cannot express how much we appreciate his sense of detail, and vision for the world of Sularia. The ultimate goal for Punch-It in 2019, will be about moving forward and developing new game ideas. We currently have a new deck builder game set in the world of Sularia in testing. We hope to have more to share about the game in quarter one of next year. We now have to build some new relationships with graphic designers to assist in creating the content that John has done for us these last eight years. This will not be a small task, but one that I'm confident we can see through. I also have many different prototype designs that we will be working to test internally to determine whether they will meet the ongoing standard's we've set out for Punch-It Entertainment games. Both Neil and I will continue to work hard for you and hope that you will stick through this transition year. We are going to work on releasing full art booster packs, which will contain Reign of Terror, and The Good, The Bad, and The Savage. Additionally, Neil and I will continue our Punch-It Plays series on YouTube, and we hope that you'll enjoy that content as well as share it with other gamer friends who have similar game preferences. We have one final series to release to you in the world of Sularia. The Foundation Series is an Alpha Program release that focuses on sites and making sites in Sularia matter. Sites are an integral part of the game, but many players choose to spend construction points on flashier cards such as tactics, conditions, and combatants. The Foundation series put the flash in sites. The deck builder will have to make meaningful card selections based on construction cost and the impact of the card on the game. You can expect the first release of The Foundation Series to hit the Alpha Program page just after the beginning of the year. Additionally, we will be releasing a complete content update to The Escalation Series sometime in January, that will modify some of the cards for clarity and gameplay based upon feedback we've received by you our players. That pack will be a single download for the entire series and will replace the individual packages on our website after its release. Punch-It Entertainment has found a way to use a Print On Demand service with our partners to offer the Alpha Program releases printed on card stock. These packs will be at a slight premium, and they will require 3-4 weeks to deliver from their order date. We will offer this service on escalation cards as well as The Foundation Series cards in the Alpha Program in 2019. Lastly, we have heard from many of you that a subscription service for our Alpha Program would be preferred. We are looking into this in greater detail and hope to have a more concrete plan available in the first quarter of 2019. I know this update was a doozy of one, with a little bit of good, a little bit of bad, and some hope for the future, but Punch-It Entertainment is not going anywhere, and we cannot wait to share some of the things we've been working on with you in 2019. Thank you so much for being fans of our games, we appreciate your unwavering support and we will see you all in 2019! Before Nationals this year I went on record saying Nationals would be won in deck building. The format was so new and power levels were more theory than practice. No one really knew what was best in this new world where you need to worry about 4 match-ups instead of 2. That means the meta as a whole contains 16 matchups instead of 3. After winning the whole thing I think that was true. I played a Protoan list whose main goal was not to move as fast as possible. My deck building ethos was generate so much free value that victory becomes inevitable. Even going into the tournament I did not know if this was the right way to approach it. Traditionally you won in Sularia by going as fast as you can. I am not saying Synthien should try to go faster than the Jotune but there was always little value in being the second fastest Synthien deck. Protoan changes all of that. No card produces more free value than Agropholid Hatchery. With that as the founding principle building the deck becomes much easier. If we are hoping to rely on tokens to out value our opponents than there are actually 2 goals we have to pursue. The first and obvious goal is we need to make as many tokens as possible. The second goal is actually the more important one because it is easier to overlook. After generating these tokens we need to maximize the ways we can translate them into a concrete advantage. Level zero of this goal is maxing out on 4 Blood Lusts. 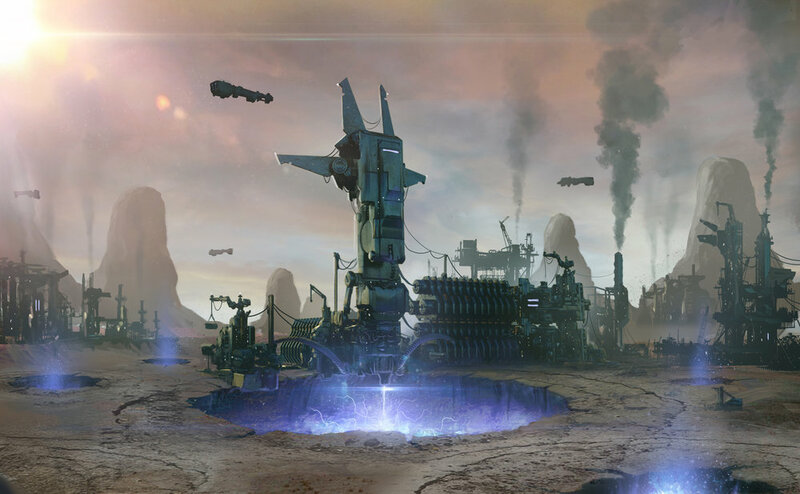 Level one is running two Metamorphosis Chambers and two Ashfall Plains to have early surrender outlets for Tricentis and also pull double duty allowing you to cash in excess tokens for advantages in combat or resources. Level two is including 3 Materox and 2 Parasitex to gain value even in the face of loss. All these layers build an impressive value engine that takes time but output ridiculous amounts of damage. As I said I liked my chances but was very concerned about fast decks. Right out of the gate I had to face off against the reigning Nationals Champion Dustin. That made me nervous but I was glad to see him on an Exsularian list and not a Kyzr Hekaton list closer to what he won last year with. The Exsularian also want to play a longer game and most of their removal is 1 for 1 so in general I like the match-up. Things to look out for are they are good at attacking sites outside of combat and they can generate surprising value from their combatants activated abilities. My deck did its best impression of an aggro deck and I was through round 1 with a win. Round two I was up against the other Kansas City competitor Logan and it was a mirror match. Being the slightly slower Protoan deck is especially critical in the mirror match. The early aggression from things like Syrana are too easy to shut down by It’s a Trap. Even without having the answer their window of effectiveness is so narrow they quickly become bad top decks. Being slower and more focused on free value you will often find yourself with more tokens or at least more things to do with them. This match-up also highlighted the strength Disruption. There is so much token on token blocking that a Blood Lust advantage might as well be the game if it lasts any length. Having even just 2 Disruptions was pivotal to winning the Blood Lust arms race at instant speed. Round three I was paired down and was playing against a newer player with a Synthien combatants list that was just too fair to fight against the free token spigot turning on consistently on turn 2. The Synthien match-up some people like because they see Satellite Network Facility as a breaker. While it can be, I think that as your plan A is short sighted. Despite being slower than the fastest decks tokens still usually end the game before round 7. Also Materox and Parasitex are there specifically to take advantage of tokens dying. Also Mount Killara comes down a turn sooner to consolidate your strength onto a smaller number of big combatants to finish out the game. Round 4 I played against my play test partner Aidan with his Kyzr to Skobn combo deck. There is not much I can hope to do against a turn 2 or 3 Skobn but I dodged that bullet and won with a stronger mid game. An interesting card in the mirror match is Carapace Dome. Dome is a card that if played tactically can win you races where their damage output doubles yours but it just does not matter because of the hardened and lair keywords.Carapace Dome is an excellent choice when it comes to racing your opponent. The Semis was a rematch against Aidan who I had just played. Again without a fast Kyzr hand I just out-valued the other Protoan deck. At this point I am pretty thankful for just how good my deck is in the mirror match since it to this point was half my matches. The finals are next and they are against Jasper who won the first ever Sularia tournament back at Great Plains Game Festival in 2016. Jasper is on a Synthien Combatants list. Our games came down to both of us dead at the end of several of them. Disruption was again surprisingly useful just shutting down late Master Mining Programs forcing him to fight harder for his Sularium. They (Synthien) have to spend sularium for all of their sources of damage so any way you can fight that helps. Some games they will generate too much for the 2 lost to matter but when it does matter it can give you multiple turns of breathing room. At this point I was very happy with my choice of tactics in 4 Mind Shell, 2 It’s A Trap, and 2 Disruption. When the dust settled I had won the finals 3 to 1. To win there is always an element of luck and I had that in spades. I had favorable match-ups across the tournament and dodged my worst possible match-up of Jotune decks. I also drew like a boss which makes things easy. The Blood Lust showed up for me and so did early tokens in the form of Hatcheries and Tricentis. All in all Nationals was a great event and I really feel I learned something about the game from playing in it. It was for value to chalk up a win against tempo. Last year I had to miss nationals for Battle for Sularia, because I was not able to get the day off. Therefore I had decided that this year I was gonna prepare extra good for the tournament, so I would have a good shot at winning it all. Yeah, that ended up not happening. Being busy with work, family and just life in general I had not played much Sularia in the months leading up to nationals. With less than a week until the tournament I still had to pick what faction I was going to play, let alone put a deck together. In my head I thought that Protoan was probably the strongest faction at this point, but the deck I had in mind for it was not necessarily one I was desiring to play. So I decided to just build one deck for each faction that I thought would be strong. Even within deck building I noticed that Jotune, as much as I like them, did not seem in a very strong position right now. Exsularian seemed pretty promising, but with the lack of play and the complexity of some of their faction I thought playing it might not be the best idea. So it came down to Protoan or Synthien. As much as I wanted to favor Synthien, the Protoan deck kept beating it in test play. The day of nationals I had still not really decided. I asked myself if I’d rather play for foil Projectus than for the title (and the foil Johnny’s!). I decided against the Protoan deck, partially because I wanted to play what fits my playstyle, partially because I felt there might be a lot of answers against the Protoan deck I would play. So Synthien it was. My Synthien deck was mostly a renewed version of the Hekaton Experiment deck that won Dustin Rogers the title last year and had been successful before the release of the Protoan and Exsularian factions. Now my version was not as heavily depending on the combo going off, or protecting it by any means necessary. I brought in just a bunch of overall good cards to just have several potential threats coming out. I was planning to make a bunch of sularium with Master Mining and Hero’s Boon and then I had multiple options to bring into play that could become a big threat. After having tested so much against my own Protoan deck I had made a last minute change where I took out the one STAB I had in the list plus a System Scramble (which I never liked in the list anyways), to replace it with two It’s a Traps, since I had issues dealing with the super aggressive Protoan list I had and was expecting to show up at nationals as well. So here I was, not as well prepared as I had said I would be, with a deck I was unsure about that it was the strongest. Round 1 would be a first test to see how it would perform. I was playing a mirror match-up against Thomas and the first game was not promising for my deck. I kept a slightly questionable opening hand that was light on Sularium generation and my small sites got stomped before I could even get anything going. My confidence level in the deck plummeted immediately. I was just hoping to not lose all my matches now. Game 2 fortunately was the complete opposite of the first game. I played a turn 2 KYZR/Hekaton, and even when that got blown up right away with a STAB, I played a Johnny right afterwards, which controlled the rest of the game. Game 3 was close. It was pretty slow as we both got some dudes out and both had a Centropolis on the field, which prevented any possible attacks on either side. That was, until I drew my one copy of Harp from my deck. I flipped 2 Defense Overrides, played Harp, so I could play a third copy, which killed three sites and left Centropolis open in the back row, so I could hit it with my combatants. After taking out Centropolis, I took control of the game and won. I was happy with the win, but it was not a convincing win to say the least, so I was not very optimistic about my chances to reach the top 4. In round 2 I was facing Zach and his Protoan list. I had not very high hopes for a good outcome in this match as I was facing Protoan, a faction I had lost so often to in testing, and I was facing Zach, which I know is a very skilled player. Game 1 I quickly got behind and I could never get back into it, the Protoan just making too many tokens. Game 2 went pretty quickly my way as I managed to get a pretty quick KYZR/Hekaton combo going that took care of the little sites that Protoan have. Game 3 was the closest game of the three, and every time I thought I had an answer to Zach’s rapidly growing board, he flipped either an Evasion or a Frenzy to make any combat a bad trade for me. So I went to 1-1, but the loss was not as devastating as could have been. Still I was hoping not to face two more Protoan decks. But Protoan it was in round 3. I was playing Aidan and he played a turn 2 Syrana. I answered by playing Johnny and after thinking about it briefly I decided that it was gonna be best for me to trade Johnny’s life for Syrana as I could not answer attacks at that point and I could not wait a turn, so he could answer with Evasion on top of Mind Shell. After Syrana’s death, I felt like Aidan had a hard time building up a good offense line and I had enough time to play bigger threats than his and win the game. The second game I was fortunate enough to draw the one card that can ruin Protoan really quickly, and that is double Defense Override. Aidan lost all his sites early on and never got enough Sularium production going after that to get back into the game. So I beat Protoan. It made me feel pretty good, and suddenly I was only a win away from making the top 4. In round 4 I was facing Colin and his Jotune list. He was to my surprise still undefeated, because I didn’t think Jotune would do well this tournament. In game 1 he definitely proved me wrong. A turn 2 Oathki, turn 3 Fenris and 3 Art of Wars later I was very dead. In game 2 I fired back with Johnny, still my all-star guy, who is very good at killing early sites or taking out small combatants. Game 3 was slow as we both mulliganed into pretty poor hands, but eventually became a battle between the big guys. His Oathki and Fenris were up against my robot army. Fortunately he split his attack, so I could take out Oathki with a Trap and Feedback. Then my robot army was big enough to win me the game. And suddenly I was in the top 4. I thought: ‘I might as well win it all now’. I think fortunately for me I was facing Colin again, so I avoided both Protoan decks in the top 4. I had more faith in my match-up against Jotune. Game 1 of our rematch went pretty quick. I was able to deny Colin of sites fairly early and snowballed it from there. Game 2 I mulliganed into a hand with 3 Hekatons. I was like: ‘Game 3 it is..’, until I saw Colin shaking his head after his mulligan. I think we both did nothing for 3 straight turns and eventually I drew cards that let me get out a KYZR/Hekaton and another Hekaton. Colin did not draw that well either, so I lucked out on that game. But.. I made the final table! I had not expected that with my last call deck decision. Then I was facing Matt in the finals. I knew it was going to be rough for me as Matt had not lost a single game all day and he was playing a Protoan deck that makes as many tokens as my deck makes sularium. It was decided that the finals would be a best-of-5 match. Game 1 was a quick stomp. Multiple tokens plus double Blood Lust equals death. Game 2 was better for me, but I feel like the game changed into Matt’s favor after he flipped a Blood Lust make my Johnny trade for one of his many combatants. Without Johnny being able to take out some of the growing swarm of tokens I could not keep up the pace. Game 3 I was off to a good start. I got an early KYZR/Hekaton out and took out most of Matt’s sites. But Lifeblood still provided Matt with enough sularium to play a bunch of threats and Carapice Dome prevented me from getting in a lot of damage. It came down to a last round of attacks. I calculated the numbers and then attacked with everything, putting him at -13. On the swingback I just had to hope he didn’t have a Blood Lust or Frenzy or anything else that would increase his attack. He did not and took me to -12. I made it to game 4, but with him now being on initiative again a reverse sweep was not very likely. And game 4 proved just that. I could not overcome an early Materox and Matt quickly swarmed the board again, taking me out. Not completely to my surprise, Protoan won nationals, but I was very happy that my Synthien list came in second. I think I also proved myself right to go with my gut instinct to play what I wanted, especially after playing Neil with my Protoan build and making a bunch of little play errors that ended up losing me the game. Overall, my deck performed well and did what it could do. KYZR/Hekaton remains pretty strong, though I did not play against Exsularian all tournament, which has a bunch of good answers for it. Johnny is still my favorite guy and I will pretty much auto include him in pretty much any deck right now. Centropolis still provides a lot of control and Harp was amazing every game I drew her. I was glad I included the 2 Traps, though I was slightly surprised how much sularium I sometimes made. A STAB or a fourth Feedback would have been very welcome sometimes. The one card that I was actually slightly disappointed in was Furtim. Every game I played him he seemed to be doing very little to nothing. I think I also played him over Johnny or a Terminator, where the attack threat would have been better probably. I am not sure if I should cut him, as he is still super strong against Exsularian, Synthien and any sort of Evasion, but just based on nationals I could use the 4 points elsewhere. And as far as dealing with these stinky Protoan, if you have seen some of the Alpha program cards, there will be an answer coming really soon! Jesse asked me to do a write up of how it felt playing the ExSularian faction at Nationals. As this was the first time the faction had seen any competitive play in a National tournament, I was happy to oblige. So how did the least well place faction at nationals perform? Well as I pulled an overall 6th placement, it was a rough road. Let's all go back to why I had decided on this faction…. For FUN! As the faction had the most variability in their playstyle, I wanted to get into my opponent’s psyche if you will. Another player in our playgroup, had given them a fair run, using all of the denial strategies available to him, and that provided for some very long and drawn out games. It opened up my mind to what possibilities that were available to them, Once that strategy entered our play group, of course as the deck brewer of the group, I had to see if i could play them counter to their obvious denial strategy. I built an aggro list that really felt punishing, but was fairly inconsistent specifically against certain Protoan builds. It was tons of fun to play though. It was a deck I had tuned up to compete for nationals, and was seriously a contender. And while I did play ExSul, it was not close to this list at all. So why did I go with a different playstyle, and change it up so close to nationals? Well this all comes down to what happened with the final release of ExSul. Up until this point we had only been testing with what was the released as the Alpha versions of the faction, and when the final cards we announce there were many changes to some of the cards, and not in a negative or powering down version. There were changes to Anarchist, Anarchy, and biggest of all Village of San Clementa. This got the gears turning in my mind I decided to build a deck that incorporated all of these changes. And all I can say was, it was fantastic. This deck entered our play group and blew our playtesting meta up!! It was sooo crazy, I just had to run this version at nationals. I spent the remainder of our time testing and editing this deck to be the most optimal. I was ready for nationals, I had decided I was going to run this list, knowing full well I was going to have some trouble with Protoan lists.. So how did the ExSul list fair at nationals… well I think that if i had drawn just a little better, in one game, the whole night may have gone differently. Let’s break down my matches. Match one was vs the man with the plan who won it all, I did stuff he did more stuff, Protoan ran over me. Match two was vs the man with a vendetta on me, this was the game i felt draws lost me this one, I had him on the ropes but the ropadopes never came, Protoan ran over me. Match three was my mirror, the other ExSul player himself. This was without a doubt the best matchup and the most fun I had. Match four vs a Synth player, I won. I pulled all the tools out of my deck in this match. All said I know that when my deck won a game, it really won. I honestly think variance was got the best of me, even against some of the matches against the Protoan that I knew were going to require me to get a little lucky to win. So for all those out there who are curious about adding the ExSul to your repertoire right now, you gotta know your command windows inside and out, and you have to know the other factions as well as everyone else. They require patience and you must be constantly thinking, what the best moves are, far more than the other factions. You must be prepared to play on your opponent's turn more than your own. Or you run an aggro list that's totally viable. I had to carefully pilot my way to an Exsul Victory and at the end of the day, I would absolutely run them again. October has been an outstanding month for us with the release of Reign of Terror and the announcement for the 2018 Battle for Sularia National Championship. We are rapidly approaching the end of the Escalation series of releases, and we will be announcing the new Alpha Edition Series coming up in January of 2019. The Good, the Bad, and the Savage have arrived here at Punch-It Entertainment. We are in the process of generating shipping labels and packaging up your copies to ship by the end of this week. This should put us delivering GBS before the expected release date of November 6th, 2018. If you are looking to find out what is different in GBS and RoT, look no further than our recent Omega Update over on our YouTube channel. The Battle for Sularia National Championship 2018 is quickly approaching. The competition is heating up, and early registration is now available. Early Registration will make sure that you get copies of the full art Disruption promo card. Additionally, we have many really awesome prizes for the competitors, which includes for the first time ever. FOIL Full-Art Promo Cards. The entire prize list and tournament information can be found HERE. November brings a brand new release of Promo Cards. Continuing with our celebration of the release of Reign of Terror, and the upcoming release of The Good, The Bad, and The Savage, this month we add two exciting and powerful staple sites in Ashfall Plains, and Stockade. These cards will be available on our website for $5 per card per play set. Four brand new cards make their way into the escalation series for November, and pack number 9 brings a host of exciting cards that introduce tons of card advantage to the Battle for Sularia game. 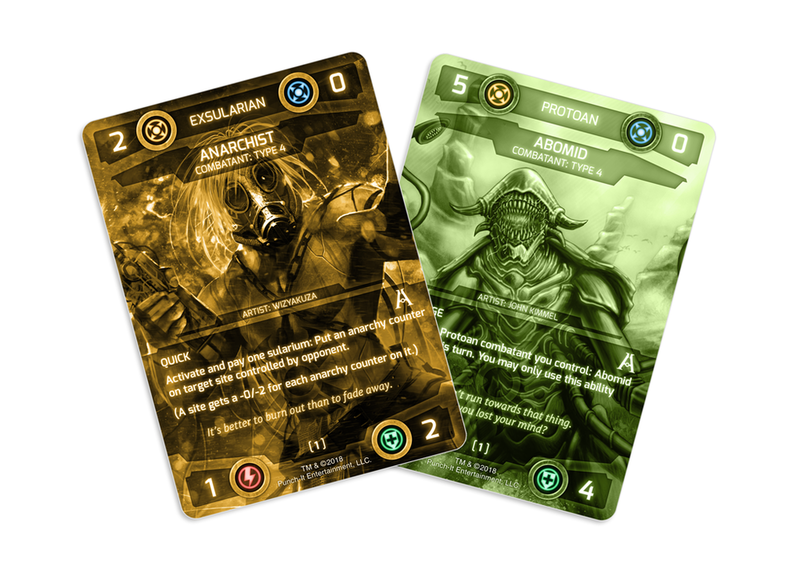 Each card is specifically designed to be thematic to the faction and provide leverage to escalate their gameplay to entirely new heights. For the first time every we approached the topic of what would a 3 construction cost Jotune tactic look like. Up until this point, Jotune construction cost has been pointed directly at their powerful combatants. Player’s have invested dearly in those combatants over the last few years and have been able to leverage powerhouses to the battlefield. To continue with creating Jotune cards that have an impact on the game and escalate their capabilities. Blessed by the Gods succeeds at every level. With a Threshold of 2, Blessed allows Jotune players to search their decks and deploy a combatant for zero sularium. The search capabilities are limited to a combatant with a cost less than or equal to your current influence generation. One of the significant weaknesses for the Jotune is when an opponent can effectively keep their sularium at bay, and they are unable to build a presence on the board. Blessed represents the idea that now Jotune players can get their hands on powerful combatants without caring about their sularium production as much. Continuing the theme of this month’s pack for tutor cards, Synthien will not be left undone. The Neural Network Facility is a powerful 6 Influence cost site that was designed by Luke Greenleaf, the 2016 National Champion. Luke loved Synthien gameplay and indicated that he liked their tactic play in particular. He also expressed sadness that by the late game Synthien were relying heavily upon draw to try and finish the game with a Sularium Tactical Assault Beam or Feedback. Neural Network Facility allows for the Synthien player to get additional value from their tactics still in the deck, but it does come with a 2 construction cost price tag. For a faction with a relatively inexpensive site curve, this is one site we expect many Synthien players to make room for. 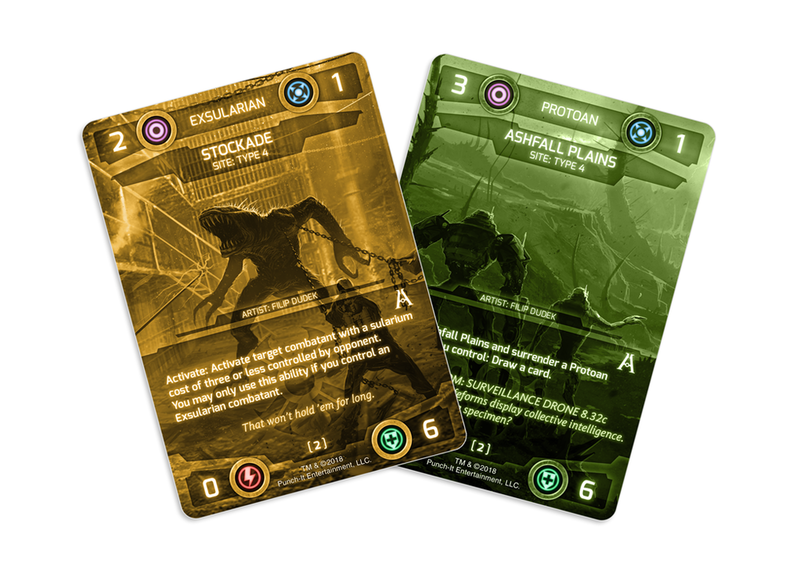 By design, the Protoan have a ton of cards that care about tokens and token production. Skriox is no exception to this formula. What the aim in the design of this card was for the Protoan to dial up the exact threat that they need based solely on the number of combatants they have on the Battlefield. Remaining thematic in design is always a goal for us here at Punch-It, and Skriox hits on both the mechanical relevancy and thematic design fronts. Being able to search out your deck for a precise threat and deploy that threat is a power that is not easily overlooked. Skriox has an additional benefit in that not only do you get a threat, but you also get a combatant in your discard pile for those powerful Lifeblood Harvest actions. Hidden in the Wastes allows the Exsularian to have their very own version of Skriox or Blessed by the Gods. Exsularian players have a desire to care about influence as part of their identity. We’ve seen this on cards such as Tackey, and Keshel Cantina from The Good, The Bad, and The Savage release. We’ve seen it in escalation from Power Broker, and the thread continues with Hidden in the Waste. Well Played Hidden in the Wastes and bring combatants out of your deck and put them into your influence row, and while they may not get played the same as the other factions search cards, it does give the Exsularian powerful influence ramping. That ramp can extend to playing tactics and conditions faster during a game, or making your Tackey larger. In some ways, Hidden in the Waste can also be viewed as being similar to playing a Blood Lust or Art of War for the Tackey. Of course, if you play the searched combatant, then you are not netting those results, but this gives Hidden in the Wastes a dynamic way to impact all Exsularian build archetypes. Well, there you go! November is set to be an exciting month in both Alpha and Omega gameplay formats. We look forward to seeing as many of you as possible at Nationals and catching up on some games. We are also excited to see what concoctions you guys brew up for the Exsularian once they are in your hands! Until Next Time Commanders! See you on the Battlefield! Battle for Sularia National Championship 2018 is Almost Here! Nationals is an opportunity for players of all skills to test their mettle against other players. The Battle for Sularia player community is so awesome, that last year we even had players that were still just learning the game competing at this level. The championship last year was won by Dustin Rogers of Kansas City. Will KC take the trophy home for another year, or will a new contender step up and claim the glory for themselves? Set Legality: The Battle Begins - Blood, Profit, and Glory - Reign of Terror - The Good, The Bad, and The Savage - All Mercenary cards including Crazy Joe and Disruption. Additional Notes: Pre-Registration before November 1st will guarantee you a copy of the participation prize Disruption. Any late Registrations or day of Registrations will receive the prize on a first come first serve basis. Winner: Johnny Cache Full-Art Foil, Winners Plaque with Johnny Cache, Design a Battle for Sularia Card for release in a future set. An upmarket menu of New American plates & Angus steaks with a vast wine list in stylish surroundings. Refined Indian restaurant pairing traditional cuisine with a wine & beer selection. Upscale restaurant & bar creating modern takes on classic Italian fare, with specialty cocktails. Refined New American dishes & wines are presented in intimate, contemporary surrounds. Tagged: Nationals, 2018, Battle for Sularia: The Card Game! September of 2018 has been one heckuva busy month as we prepare to launch Reign of Terror to each of you on October 2, 2018. For those of you that have pre-ordered the product, your packages will be sent out by Friday of this week, and you should receive your products by the 2nd. If you have any questions regarding your pre-order, please fill out a submission form, and we will respond to each of your requests as fast as possible. The Good, the Bad, and the Savage are progressing to the final stages of development. We will begin final Q&A proofing of the print documents for the final print file to be sent to our print partner. We received all of the final art pieces in the last week, and we have posted them on our social media channels. But check out Sularium Depot below! We love what our artists have put into the Exsularian pieces, and The Good, the Bad, and the Savage is turning out to be one of our most stunning sets yet! The Good, The Bad, and The Savage ships to you on November 6th, 2018. Reign of Terror will release and be ready for Omega game play next week on Tuesday, October 2nd, 2018. There have been many updates to cards and rules for Omega play. We will be updating our rules document in the coming weeks, to prepare for the new rules. When that document has been released we will update each of you through this blog. The new rules document will be available to download to your electronic device. We are also looking to compile a comprehensive FAQ regarding cards, if you have a question regarding a specific card's interaction please let us know so we can add it to our website. October brings a brand new release of Promo Cards for October. This month introduces two impressive new combatants from the Reign of Terror and The Good, the Bad, and the Savage releases. Four brand new cards make their way into the escalation series for October, and pack number 8 brings a powerful new combatant and exciting new tactics the core factions. These are cards that deck builders will not want to miss regardless of whatever faction you love the most! Ashgar's Duty is a card designed by national champion Dustin Rogers. He wanted a card that gave the Jotune a proven ability QUICK. As a two construction cost card, Ashgar's Duty is not an automatic inclusion in Jotune player's decks, but there are specific game archetypes that will benefit most from a card like Ashgar's Duty. With a fairly high threshold cost, Ashgar’s duty gives the Jotune a powerful way to finish off their opponent in the later stages of the game. Ashgar's Duty is a card that will see play in competitive formats, and we cannot wait to see how it fits into your Jotune builds. Last month we introduced Simiann a new combatant that uses Energize as a reliable defensive option. This month brings another Energize combatant to the table, and this one serves as a valuable aggressive combatant for those Synthien aggro lists. Last month's post discusses how energize operates using Simiann. The same rules apply to Juggernaut Mauler with a much higher ceiling. Bellowing Roar is a brand new tactic for the Protoan and offers an excellent control piece for the faction. Players will be able to leverage Bellowing Roar by playing the more substantial Protoan threats. As a one construction cost tactic, fitting Bellowing Roar fits into a player's deck easily. The drawbacks to Bellowing Roar exist in two different spaces. First, players have to decide what four cards of their sixty in the tactic and condition department could be cut to make room for it. Additionally, players have to play the more powerful combatant suite in order to turn on the card and provide a useful result. While Bellowing Roar has a similar effect to Centropolis in the Synthien, it does not offer the consistency and cards such as Evasion are much more profitable in the exchange. From the Rubble is an exciting new card for the Exsularian. As a two construction cost card, From The Rubble provides an excellent new tactic that gives the Exsularian another valuable control piece. Synergizing nicely with Anarchy mechanics, From the Rubble allows an Exsularian player to pull valuable high powered sites from the discard pile. From The Rubble can grab your opponent's sites or your own. It does come with one major drawback in that the site's defense is reduced therefore making it easier for your opponent to remove. Additionally, the Anarchy package tends to push construction cost limits to near break point and From the Rubble doesn't alleviate this. When deck building with From the Rubble players will actively have to find a way to fit the cards all together in their 60 cards and 90 points. We hope you are all enjoying the upcoming content. We are very excited to get the Protoan into your hands and hope you share with us your decks and favorite cards from the set on social media and elsewhere! Until next time, see you on the battlefield. Hello, battle commanders back again with a brand new update regarding what you can expect this month in the world of Sularia. April is a very much for Battle for Sularia and the Alpha Program. Read on to learn about the Kickstarter, and the April Alpha Program updates. Reign of Terror: The Protoan is now funding on Kickstarter and we have until April 20th, 2018 to reach our goal of $9,975. The Alpha Program continues to evolve and we will discuss all of those things in this update. Reign of Terror: The Protoan was launched on Kickstarter March 27th, at 10:00 am and a number of our faithful backers were ready to pledge. Because of that, we had our second best opening day on a Kickstarter ever. Our best is still held by Blood, Profit, and Glory. The Protoan missed the mark of best by 8 backers is all. We love all of the support and want to take a moment just to thank all of you for being so awesome! We've had numerous reviews come in before the campaign and it has been very encouraging as we have not had a single negative review from anyone at all! This is astounding and we cannot be more pleased with the results. We also started testing a brand new idea of live streaming across YouTube. Our first stream can be viewed HERE. We also did a Let's Play session using the Protoan which can be watched HERE. Going forward in this campaign and potentially post campaign we will be hosting live stream Let's Plays of the Alpha Cards each Wednesday, starting at 7:00CDT and going for one hour. We hope many of you will tune in and potentially get a game or two in with us over Tabletop Simulator. April brings the newest command pack to be released into the Alpha Program and much like March's release, there are some cards here your collection simply cannot be without. This month's Jotune card is a fantastic and affordable tactic. Path of Enlightenment is a serious contender for the card of the pack allowing the Jotune to have a draw engine outlet for any sularium they might have laying around. This card is how the Jotune players can fuel more combatants into their hands and boy is it nice to deploy a Gray Harrier and before it resolves, pay additional sularium to draw cards to your hand. With the state of the Jotune currently, if a player built a lower cost curve of combatants in their deck, they would start to rely solely on top decking after round 4 or 5. With Path, they can refuel their hand of cards more effectively and strategically, instead of relying only on luck. Which, thematically speaking, also matches up with their superior tactics and focused training—according to their lore. Not to be outdone by the Jotune, the Synthien are ready to turn up their power to 11. Neural Network Boost is another powerful Synthien condition. At 4 cc (construction cost) and 2 sularium maintenance, this card is both expensive in deck building and expensive to remain in play. What makes Network Boost more reliable than Path for the Jotune is the consistent one extra card during the draw phase. Additionally, combining this card with Dr. Lehner gives the Synthien player 6 cards before your opponent is allowed to draw. This is a very powerful card for the Synthien, but one that they can afford with their enhanced ability for the mining and processing of sularium. The Protoan are getting a brand new Type 1 site to add to their arsenal in pack 3 and this card is quickly becoming one of our favorites in deck builds. At 3 cc, it is expensive to play, but more than makes up for it in gameplay impact. Coming in as a four influence site, Hive of Cera does just about everything a Protoan player could ask for. The birthing grounds of the original Primordial Cera from pack 1, the Hive is going to produce more 1/1 Terrorbite tokens. Not only that, it will allow you to search for additional copies of Cera for buffing your Primordial Cera even faster. Combined with Crazy Joe, the Primordial Cera will become a monster on the battlefield very quickly and one that the opponent cannot allow to remain unchecked. The Exsularian are a faction never to be outdone by the others on Sularia. They have fought, salvaged, and gambled their way to a place in the world and Feeling Lucky is right at home with this faction. Following the theme from last month's card, the Exsularian care about their influence on the world of Sularia, and nothing like a little Power Broker'ing to success with Feeling Lucky. Don't have a site to play this turn?—no problem—if you're Feeling Lucky, you'll likely end up with a handful of powerful tactic and condition cards. Everything an Exsularian player could hope for to ensure victory against the steepest of odds. It's time to signup again for our monthly Tabletop Simulator tournament. This month will be held on April 14th at 12:00CDT. The entry is free to anyone with the mod, and the prize to the winner will be their choice of an Alpha Promo card set from April. Normally, we try to hold these tournaments on the third Saturday of every month, but we will be attending Pretzcon and running a real life Alpha Tournament there instead. Sign up for free on our Alpha Program page. Additionally, all Alpha Program cards released to date, including April's pack, are legal for this tournament and can be found inside the mod. The Alpha Program April promo cards will be released today for you to begin pre-ordering. You can expect an email coming soon after this update with the promo codes for these cards. If you are not already signed up for the Alpha Program, be sure to signup on our Alpha Program page and you should receive the email codes in your inbox in about 24 to 48 hours after you signup. Be sure to check your spam folder though, as many users have reported the email going straight to spam. In celebration of the Kickstarter, let's officially welcome the Protoan to the Alpha Program with the brand new monochromatic cards for Parasitex and Syrana. You will not want to miss adding these to your collection! April looks to be an absolutely awesome month to be a Battle for Sularia fan and we hope you agree. Be sure to check us out on our live streams during the campaign and don't forget to get your promo cards ordered before they leave the store!